It’s been a week since we were at Retail Expo and we think it’s safe to say it was a huge success. If you came along to see us we loved meeting you. If you didn’t manage to make it, here’s our round up from the event and maybe we’ll see you next time? 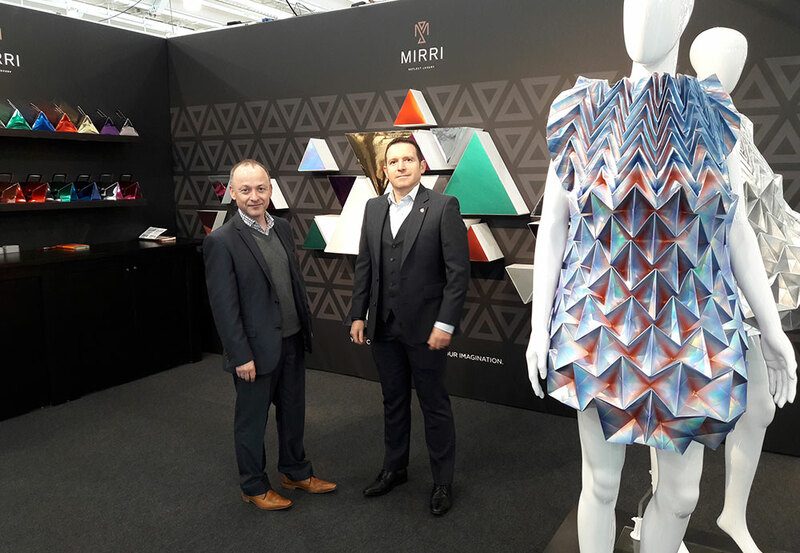 Retail Expo was the perfect place to reintroduce Mirri to the retail market. And with a new visual identity and fresh approach, we took the opportunity to show people that Mirri is so much more than what was often historically thought to be just a silver paper. And we did it. Our stand featured over 30 different substrates finished in a variety of Mirri finishes. Each finish was used to highlight its versatility on different materials and to showcase our range of metallic finishes that can be applied to just about any POS substrate. We also had a few surprises up our sleeve. in partnership with fashion and textile designer Jule Waibel, we commissioned some show stopping fashion pieces, as an example of ultimate creativity that can be achieved using Mirri. Throughout the event, we met with several large and premium brands. By encouraging visitors to experience first-hand how tactile the Mirri product is, we could prove the value of Mirri goes much further than its initial visual appeal. Many of the brands and retailers we met were very interested to hear that their initial positive reaction is also backed up by research carried out by the Retail Institute who claim that what they call ‘a pleasant tactile input’ leads to a customer overvaluing an object in the decision-making process influencing their intent to buy.